A plethora of detailing services in Kanata! 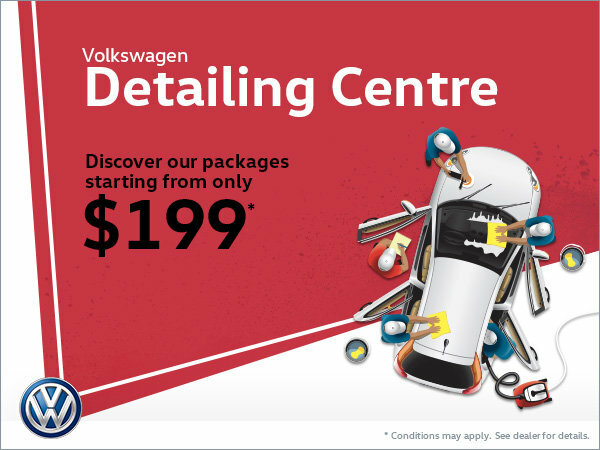 Discover all of our detailing services at Myers Volkswagen. Packages start from only $199 and include complete car washes, paint sealant, windshield treatments and much more! The Gold Package starting from $199 includes: Shampoo and steam of the carpets and seats, vacuum in the trunk, cleaning of the leather seats and treatment, cleaning of windows, cleaning of dash and vinyl, exterior wash, cleaning of rims and tires. The Platinum Package starting from $299 includes: Shampoo and steam clean seats, shampoo and steam clean carpets, vacuum trunk, clean leather seats and apply seat treatment, clean interior windows, blow out / clean dash and vinyl, clean rims / tire shine, exterior wash and wax. Many other packages available. Contact us for more information.